Scientists have detailed a significant proportion of the genes found in the extinct Tasmanian "tiger". The international team extracted the hereditary information from the hair of preserved animal remains held in Swedish and US museums. The information has allowed scientists to confirm the tiger's evolutionary relationship to other marsupials. The study, reported in the journal Genome Research, may also give pointers as to why some animals die out. The two tigers examined had near-identical DNA, suggesting there was very little genetic diversity in the species when it went over the edge. 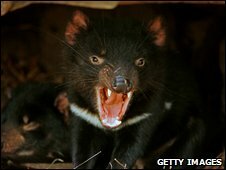 Although it was hunting that finally drove the Australian animal out of existence, its longevity as a species may already have been fatally compromised, the researchers believe. The lessons should not be lost on modern conservation efforts, the team says. "Looking at the genetic diversity in a population is a key marker for endangerment and it should be used to assess the urgency of preservation," Professor Stephan Schuster from Penn State University told BBC News. 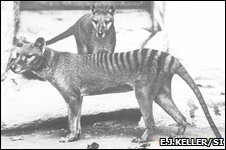 The Tassie tiger (Thylacinus cynocephalus) was dog-like in appearance and striped like a big cat - but in evolutionary terms, it had little in common with either, and was more closely related to kangaroos and koalas. Wild thylacines were present until the early 1900s; the last known captive specimen died in Hobart Zoo in 1936. Its recent demise, and the existence of several well-preserved specimens in museums, has led many to speculate that the animal might be the best extinct candidate for attempted resurrection through new molecular science techniques such as cloning. But the team behind the latest research says its motivation lies in a different direction. "Our goal is to learn how to prevent endangered species from going extinct," said Webb Miller, another Penn State professor and a member of the research team that includes scientists from the US, Sweden, Spain, Denmark, the UK, and Germany. "I want to learn as much as I can about why large mammals become extinct because all my friends are large mammals," Professor Miller added. "However, I am expecting that publication of this paper also will reinvigorate discussions about possibly bringing the extinct Tasmanian tiger back to life." The team extracted DNA from the preserved hair of the tigers. This tactic has recently become a fruitful avenue of research. The DNA molecule will degrade over time, but the hair shaft's keratin material slows the decay and limits bacterial contamination. This same team used the approach to piece together about 80% of the genome of a woolly mammoth, a beast that disappeared several thousand years ago. 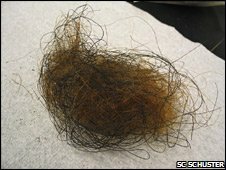 "The hair is like a shrine for DNA," Professor Schuster said. "In bone you have millions and millions of porous channels, and micro-organisms can penetrate it very deeply; and when they die inside the bone, they deposit their DNA on top of the DNA of the animal. "In hair, the bacteria are mostly on the outside, and you can use protocols to decontaminate the hair and once you have done this, you resolve the material from the hair shaft and you retrieve the DNA that was stored on the inside." This latest research has identified the small set of genes found in mitochondria, the structures that power biological cells. The DNA in mitochondria is handed down from mother to offspring. Because it mutates at a stable rate, researchers can use it like a clock to time the divergence of species. By doing this, it is possible to show that the tiger's closest living relative is another marsupial called a numbat. "The two thylacine sequences were extremely similar to each other, with only five differences in 15,492 nucleotides," Professor Miller further explained. The team says this level of similarity suggests that as the species neared extinction, there was too little genetic diversity to resist bacterial and other environmental stresses. Had hunting not taken out the last individuals, they would have been extremely vulnerable to disease, for example. "This is the danger of a clonal population," Professor Schuster said. "Low genetic diversity is appearing as a common theme in the extinct species being studied by our team." The team is now looking at the genetics of the threatened Tasmanian devil (Sarcophilus harrisii) whose remaining numbers are currently being ravaged by a transmissible facial cancer. Early research indicates genetic diversity in the devil is also very low. "We're trying to find the genetic differences between them, only this time around we would like to use this information for pedigree selection," Professor Schuster told BBC News. "We will tell the breeding efforts already under way in Australia which animals they have to breed to have the maximum success in stabilising the population, and to breed the most genetic diversity possible."